Flim- Flam! 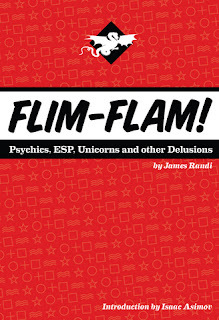 Psychics, ESP, Unicorns, and other Delusions is a book written by magician and skeptic James Randi. 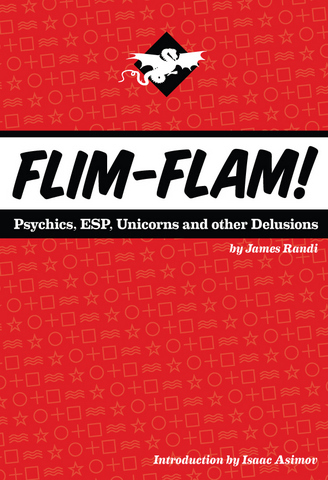 In this book, author James Randi discusses paranormal and pseudoscience claims and how scientist have failed to provide accurate research in dismissing these absurd paranormal claims. James Randi provides convincing arguments as well as evidence to his readers in how these claims are in fact faked and or fraud and should be dismissed. The topics the book explores and exposes are claims about UFO's fairies, psychic surgery and religious cults. The book also talks about James Randi million-dollar challenge. James Randi has invited all psychics and anyone who claims to have a paranormal ability to prove this by submitting themselves to a test chosen by James Randi and prove to the author that they do in fact have a gift and or not frauds interestingly enough till this day no one has beaten the challenge and very few have accepted to even take it the million dollar challenge. My favorite part of the book was chapters 2 entitled fairies at the foot of the garden. In this chapter James Randi discusses the incident that happened in 1920 in London. 2 young girls created a deception that fooled many people over the years, including the creator of Sherlock Holmes, Sir Arthur Conan Doyle. While playing in Cottingley Glen, the two young girls took what they claimed were close up photographs of fairies. The girls than took each other's picture with the fairies and experts who were consulted regarding this matter said that there was no way that these photos were faked and therefore the girls must have really been taking pictures with fairies. The point of the story is that People believed this story and even experts agreed that there was no way the girls could have faked these photos, the only logical explanation was that the girls had in fact taken pictures with real fairies. The reality of the matter is that the girls had posed with cutout of fairy drawing to make the pictures seem real and authentic. After several decades the girls were both interviewed and confessed that yes this was in fact true and began as a prank but soon the pictures got out of hand as the story was publicized so they felt they could no longer come out and say the truth. The fairy incident that happened in the 1920 ties inn to the pseudoscience and the paranormal course we are currently taking in that it shows how people will believe anything without any whatsoever scientific explanation. This particular incident reminds me of the magnetic bracelet we discussed in our lectures how the creators claimed that these magnetic bracelets 's had the capacity to reduce arthritis pain and even cure if worn on a daily basis. People began buying these bracelet’s in hopes that they would reduce their pain by wearing them. The reality of the fact is that there was no plausible scientific explanation to explain how and why these bracelets’ worked, and therefore the bracelets were just another scam. The fairy pictures had no real good evidence to prove that these fairies were in fact real and the pictures were not altered, people just began to believe this without any science to back it up. I found this book very interesting and very informative. James Randi showed compelling evidence and proof that most of these so claimed psychics and gifted people along with other paranormal phenomenon’s are fake and not real, and we should be taking science and scientific explanations into consideration before making a decision on what we choose to believe.